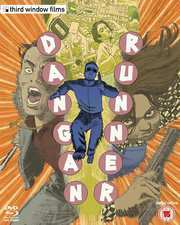 The advertising feels just a tad hyperbolic for Dangan Runner, as Third Window Films market it as the directorial debut of SABU. That would have greater import if we could see any of the 20 other features made by the director since 1996 (two years before Run, Lola Run if you’re drawing comparisons), but alas, type Sabu into Amazon’s search engine and you’ll end up with The Thief of Baghdad, The Jungle Book, and The Drum, starring vehicles of India’s most famous export to Hollywood, not the Japanese director. Actually import is the key word here, as if you try typing Sabu in the search engine of Amazon Germany, you’ll have a lot more luck. It seems this director has a lot more appreciation on mainland Europe. Hopefully his English territory fortunes will improve with Third Window Films’ release of his first film. 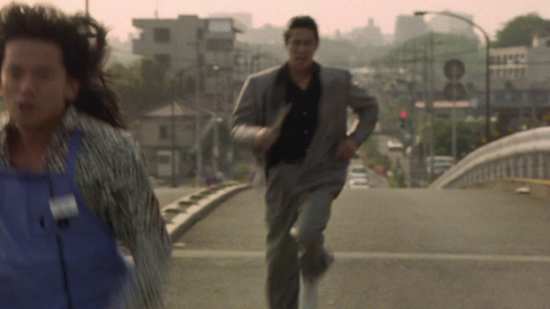 The yakuza Takeda chases the junkie store clerk Aizawa with a knife. Aizawa chases the incompetent bank robber Yasuda with a gun. 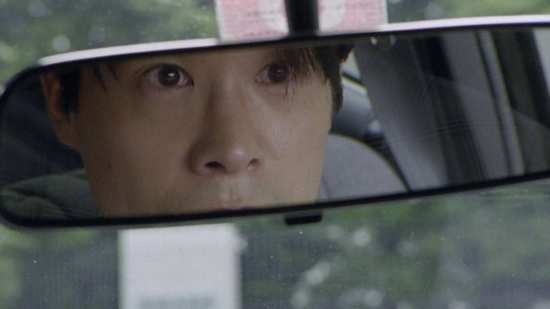 A pathetic stick-up in a convenience store and a chance collision on the street kicked off this lengthy chase sequence, but there is a lot more linking the three men than just that. On top of that, their personal vendetta is caught up in the turf war between two yakuza groups, and an investigative police unit. 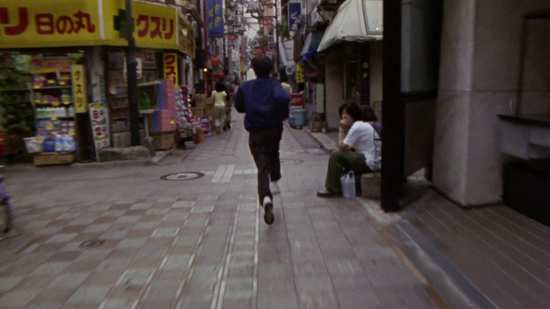 I’m doubly impressed with the Blu-ray transfer if IMDB is correct and Dangan Runner was shot on 16mm, as it looks fantastic. The image is clear and sharp throughout, colours are consistent, detail levels are excellent, and when it comes to contrast and dark detail, the film doesn’t put a foot wrong. You have the choice of English and German menus on disc insertion, before the disc boots to an animated menu. The film gets an audio commentary from Jasper Sharp, detailed if a little dry. The interview with director SABU lasts 12:52. V Cinema: Video Essay with Tom Mes lasts 18:19, and looks at the Japanese straight to video industry which came into its own with the decline of the cinema in the eighties and nineties. Cinema, motion pictures, the very concept is dynamic. So when you make a movie where your characters are always in motion, layering motion upon motion, it can be transcendental, meditational even. Dangan Runner isn’t like that, although it does have its moments. Instead Dangan Runner is more of a dark absurdist comedy, and for the most part it holds the attention, delivering something unique and unexpected. Its story focuses on three characters, Takeda, Aizawa and Yasuda. The film unfolds with a fractured narrative, jumping backwards and forwards through the story, so that we meet the characters first, before learning through flashback who they are and what motivates them. 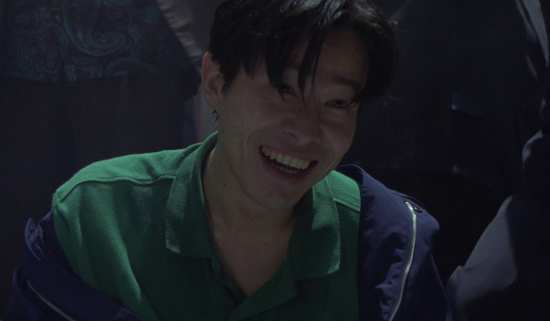 We meet Yasuda first, the wannabe bank robber who we see rehearsing his heist, before he attempts to put it into effect and botching it completely. We learn he’s a milquetoast, walked upon by his cheating girlfriend, and lowest of the low in the restaurant where he works. He’s decided to reclaim his confidence by robbing a bank, only he forgets to buy a facemask to hide behind. 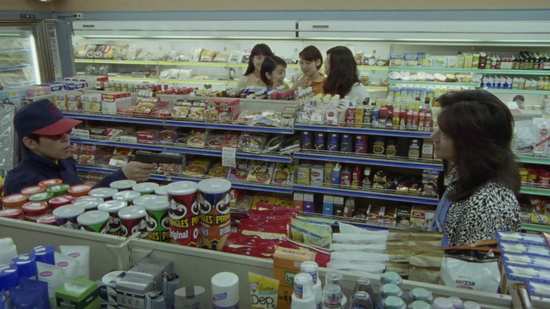 Things go even more wrong in the convenience store where he tries to get the mask, and he manages to provoke the ire of the store clerk, Aizawa, and so the chase sequence begins. Aizawa is a failed rock singer who got hooked on heroin, and he was high when he caught Yasuda trying to steal a face-mask from the shop, so his pursuit is particularly single minded. As they race through the thoroughfare, they bump into Takeda, the dealer to whom Aizawa owes money, and with a murderous intent, Takeda sets off after both Aizawa and Yasuda. Takeda’s a yakuza, only not a very good one. He professed his loyalty to the gang, and the boss, but when it came down to it, his nerve broke, and he got both his ‘older brother’ and his boss killed. A failure of a bank robber, a failure of a singer, and a failure of a bodyguard, chasing through the city for hours on end, all have plenty of time to reflect on who they are, and what brought them to that point, and we learn that there is more connecting the three than just their encounter today. The incident that sparked off Takeda’s angry pursuit also plays into the bigger picture. 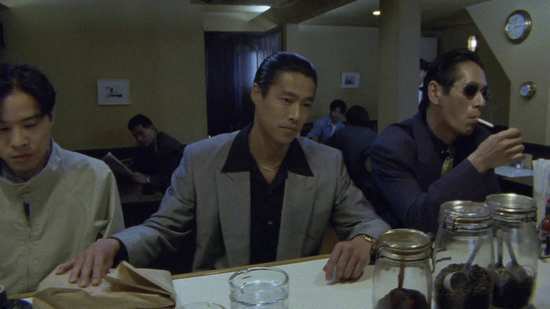 The attack on his boss is the seed of a turf war between two yakuza groups, and the police are in on the action as well, as a quartet of gun happy detectives want to serve some justice, Dirty Harry style. Only one of the detectives is trying to hide the fact that he’s lost his gun; a gun which through convoluted means is now in the hands of Aizawa. It’s an absurd and contrived premise, and one which the film treats with the comedy it deserves. The cast of characters are larger than life, and the story seems to always take the unexpected route. For a comedy it can be unexpectedly dark, while the ‘loneliness of the long distance runners’ takes them on an unusual psychological journey. It’s a film that’s infuriatingly hard to define at times, despite making me burst out laughing on more than one occasion, but it’s also a film that lacks for a satisfying ending. For me Dangan Runner just fizzled out at the end, as breathless and as worn out as its protagonists, slipping into a soporific malaise that is as deflating as it is unfulfilling.